Feel Bach! flower remedies blog: Can't Make up Your Mind? which of your friends or relatives will give you the right answer? It could be something important. Should you get married? Should you quit your job and take a new one? Should you choose one college over another? Or it could be small things. Should you plant petunias or pansies in the front flower garden? Should you wear the blue shirt or the white one? If you're plagued with this kind of indecision, you’re in a negative Cerato state. This negative state occurs when you’ve lost belief in your higher self. It causes you to mistrust your inner voice and seek guidance from others – even if they don't know the answer any better than you do! It also causes friends and family to become annoyed with you. Most of us really don't want to be responsible for making other people's decisions. But the negative Cerato personality will persist in asking - and asking again. 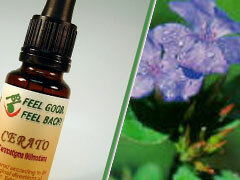 Doctor Bach classified Cerato as one of the “Twelve Healers” in his collection of 38 flower essences. These twelve he described as key to transforming root personality imbalances, which he believed were associated with physical illness as well as mental and emotional distress.